AS I START A GRAPHIC DESIGN COURSE, I WANTED TO MAKE SOME FUN FILLER CARDS FOR ALL YOU DESIGNERS OUT THERE! 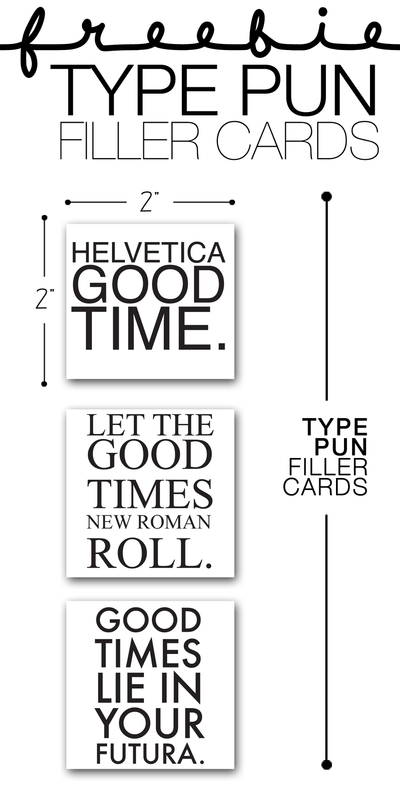 THESE 2" X 2" FILLER CARDS ARE TYPE PUNS THAT ANYONE WOULD LOVE! GO AHEAD AND GRAB YOUR FREEBIE DOWNLOAD BELOW, AND BE SURE TO CHECK OUT HOW I PUT MINE TO WORK IN THE LAYOUT 'SHILLONY'. I USED MY 2X2 CARDS IN A SCRAPBOOK LAYOUT TITLED 'SHILLONY'. I INTERMIXED SCRAPBOOK PAPERS WITH BLACK AND WHITE PHOTOS AND MY FILLER CARDS. I TOPPED THE SPREAD OFF WITH ENAMEL DOTS, WASHI TAPE AND SOME TEXTURAL PAINT LAYERING AND IT WAS COMPLETE! DRESS YOUR TECH, YOU BOOKWORM!